When driving on a long journey it is fun to have easy road trip games to play. 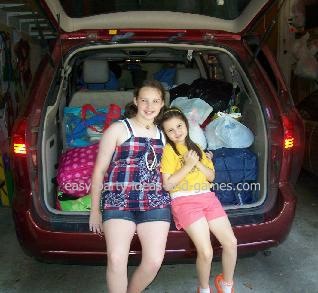 But don't save them for vacations - travel games can be played in the car when just going across town. I'm proud to say that my family and I have traveled by car over 23,000 mile in 5 years, visiting all 48 contiguous US states! Along the way, we have played a lot of road trip games. One important thing to remember with car games is that the driver should not participate so they can concentrate on the road. There should also be no airborne objects. Safety first! Car trips are a great chance to gain a little geography knowledge. Perhaps playing fun road trip games, such as a printable United States Trivia game that you easily print and play. There is a game available for every state! One of our favorite things to do when on a road trip is to listen to books on tape. Your library will probably have some on tape (or CD) that you can check out or order. Another fun thing to do for car games is to read from a riddle book or joke book. Along those lines, nursery rhyme contests can be fun road trip games. Take turns with everyone reciting a different nursery rhyme. See who can remember the most nursery rhymes! Alphabet Game - Look for letters on the cars that pass you on your road trip. First look for an A, then a B, etc. Time it and see how long it takes you to get to Z. Then, the next time you play it, see if you can beat that time! Route 66 Game - Doesn't matter if you are on Route 66 or not, you're trying to add up numbers on license plates until you get to the exact number 66. States Game - Look for State Plates from different states and keep a tally. Billboards - Pick words from billboards to create sentences or stories. Bingo - Make up a bingo card before you go, with animals you're likely to see, types of signs (McDonalds), etc. along your trip. Then, as you drive along and see something mark your bingo card. Colors - Have each person select a color car (or brand, or type) and county how many of these they see. Pairs - Watch for pairs of things - 2 cows, 2 red cars, 2 billboards, etc. There are several terrific card games and hand held games made specifically for road trips, and they are made for all age groups as well. You can see what is available thru Amazon. Hide and Seek- One player finds a name on a map and tells it to the other player who must look for it. Name Games - Look for places that have animals or plants in their names. One of the classic road trip activities is to sing songs. Stick with folk songs that everyone knows (or can learn) and have fun! Remember, don't distract the driver, but have fun on your trip!